After switching from Business Objects XI 3.1 to BO BI 4.1 I noticed one difference which I did not like at all. The Web Intelligence Java Applet (the default report editor, also formerly known as the Java Report Panel) takes forever to load. Why is this? When I start using a new version of Business Objects I always expect that it will take a while to open the Web Intelligence Java Applet. I know that it first needs to cache on my PC and so I need to expect that it will take a while to download the applet. However, after my initial WebI editing session for each BO environment, I expect that BO can detect that the WebI Applet is already present on my machine and that it will load the Java applet much faster as a result. Nevertheless, this is not happening. 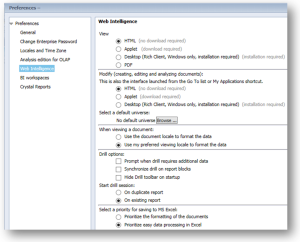 After many different Web Intelligence editing sessions I feel that most of the time I am experiencing the same slow loading time as I did the first time I initiated a the WebI Java editor on my PC. According to SAP support engineers the caching of the Business Objects Business Intelligence 4.1 (BI4) Web Intelligence Java applet is done by detecting the JAR file, the hosting server’s IP address, and the BO version. If all three of these don’t match then the JAR file is downloaded. In my limited understanding that means that if you are using multiple web servers to serve up the BI launch pad web application you can expect to have to download for each server. Furthermore, I think that if you use a Virtual IP address and/or load balancer then you may notice that your PC will always download the applet. Honestly, I am not sure you can solve it at the server level without hampering your web architecture. A possible workaround is to edit your preferences and change your Web Intelligence “Modify” setting to use the HTML editor (see the image below). 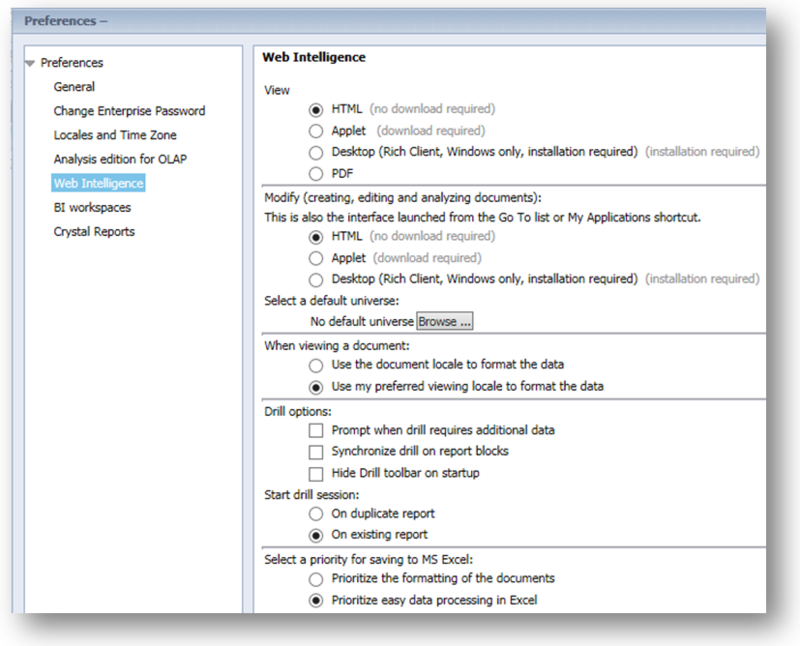 The BI 4.1 HTML editor has quite an extensive set of features; so much so that I am not sure what the Java Report Panel can do that the HTML editor cannot. There are several features that are not there in HTML interface.